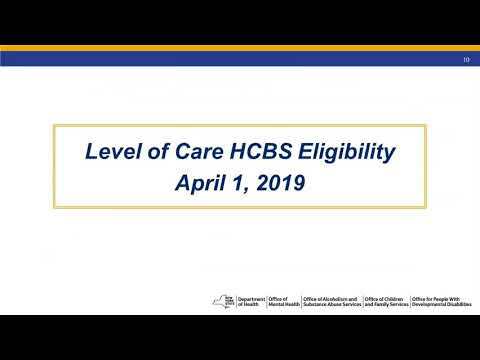 This Home and Community Based Services (HCBS) Level of Care (LOC) Eligibility Determination training covered the process for determining HCBS/LOC eligibility for the new Children’s Waiver beginning April 1, 2019. Beginning April 1, 2019, children seeking HCBS can only be determined eligible under the new Children’s Waiver by Health Home care managers, the Independent Entity C-YES or the DDRO. Target Audience: Children service providers inclusive of Health Homes, Health Home Care Management Agencies, Waiver Providers, etc.